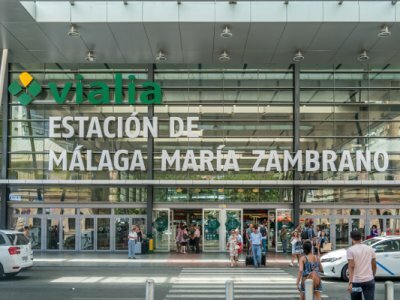 The Málaga station is called Málaga María Zambrano and it is after Seville - Santa Justa, the station that receives the most passengers in Andalusia per year. At the moment you can get AVE tickets at really reasonable prices for traveling to Málaga. Through our search engine you will be able to compare among all the prices, as well as to choose the best timetables that suit your journey plan. In Málaga you can expect culture, good gastronomy and beaches, as it is the entrance to the Costa del Sol. The station is in the centre of the city and you have the bus station next to it. The arrival of the AVE contributed in the increase of passengers in this station. The station has a trajectory before the AVE as well. It was inaugurated in 1862, inauguration in which Queen Isabel II attended. Anyway, between 2005 and 2007 there were works carried out that changed the station a lot. These changes were necessary to be able to take the High Speed ? ?to Malaga with success. The railway installation has two floors. In the underground there are only two platforms and services are provided by Cercanías Málaga. The station of the surface is already bigger and has more platforms. In it, the services of Media Distance and Long Distance (AVE, Alaris and Estrella) are provided. There is also a shopping centre inside the station. It is called Centro Comercial Vialia and there is Mercadona, Zara, Media Markt and even a cinema of the chain Yelmo. A historical fact that is related to this station is the removal of the marquee of the engineer Antonio Arriate in 2003. This removal generated a controversy that lasted for years. After many years it has been decided that it is going to be restored and recovered and placed in a place close to the one where it already was. This canopy was dismantled to facilitate the works of the new station. Many political, cultural and social institutions protested and asked for it to be reinstalled. The station has, besides a shopping centre, all the necessary services. It has Dialoga service, a service designed for deaf and hearing impaired people. It also has parking, toilets, luggage racks, car rental service, cafeteria, ATM, hotel, etc. The station also offers services adapted for people with physical disabilities such as wheelchairs, adapted lifts and adapted platforms. The station is open daily from 05:00 a.m. to 00:45 p.m. and it is located in the Explanada de la Estación S/N.